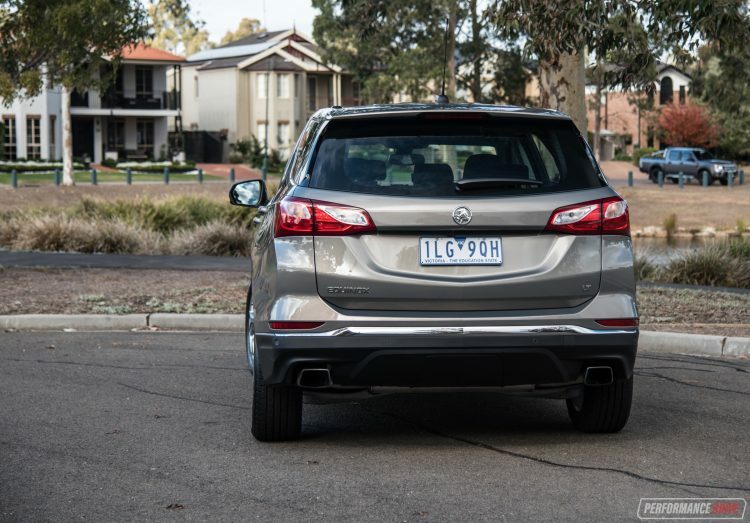 Holden is describing it as the world’s most user-friendly SUV. The nameplate might not be familiar in Australia, but the Equinox badge can trace its roots back to 2004, launching in the US under GM’s Chevrolet brand as a mid-size SUV. 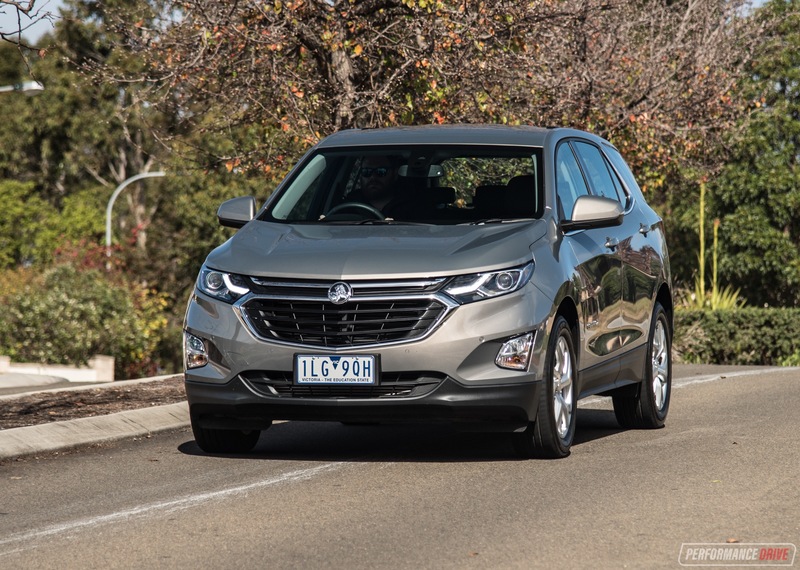 You can think of the Holden Equinox as a replacement for the Captiva. 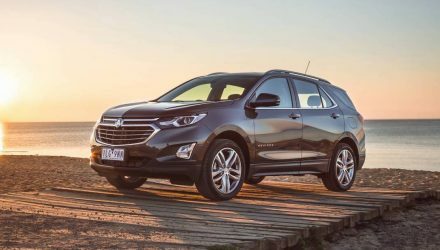 Unlike the Captiva, which was made in South Korea under GM’s Daewoo arm, the Equinox is made in Mexico at GM’s San Luis Potosí facility. 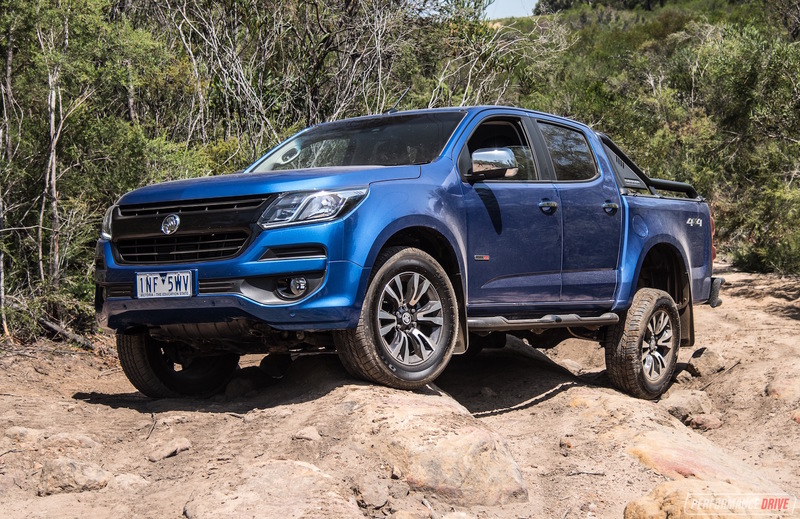 There are a number of different flavours available in Australia, with engines ranging from 1.5L turbo, 2.0L turbo, and 1.6L turbo-diesel. 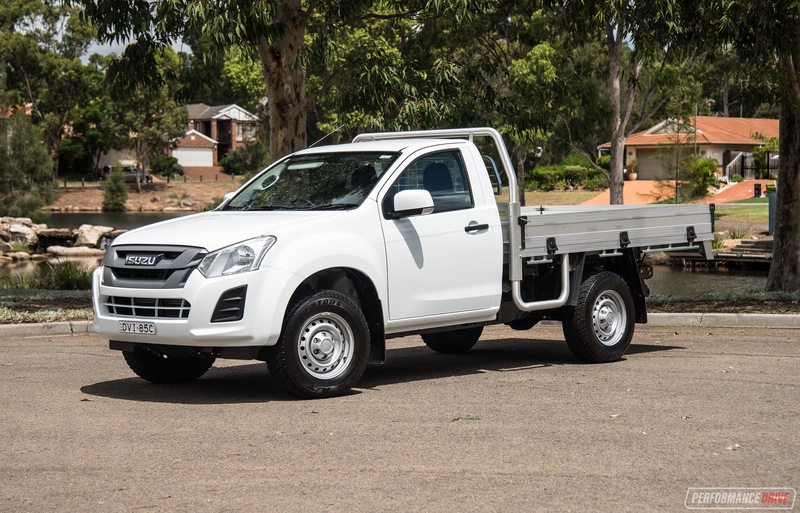 Both front-wheel drive and all-wheel drive options are available too, and all feature five seats. One of the biggest attractions to the Equinox is sheer value for money and comparatively low prices. 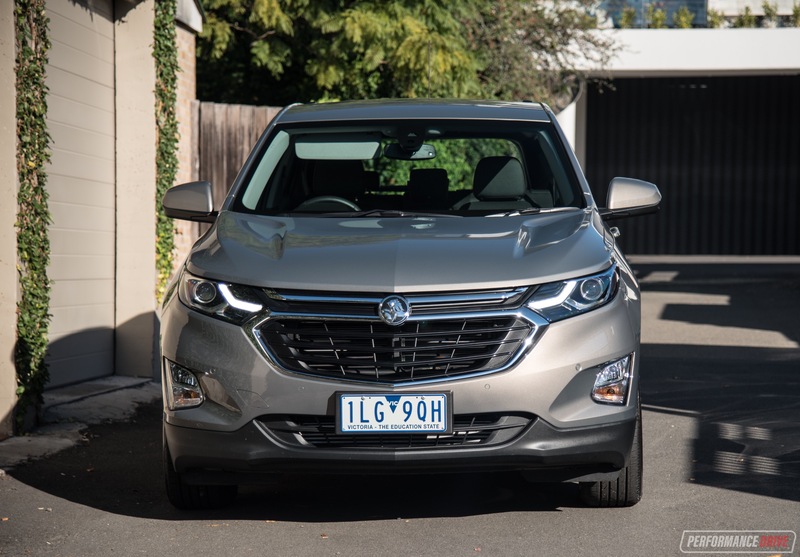 Here we’re testing the Equinox LT with the 2.0-litre turbo-petrol engine in FWD form, which sits in about the middle of the range. Prices start at just $36,990, which, as you’ll soon find out, is not much considering how much vehicle you’re getting. Chevrolet’s styling language is quite obviously applied to the body. In fact, the overseas Chevrolet Equinox looks identical aside from the badge and a few very minor trimmings. 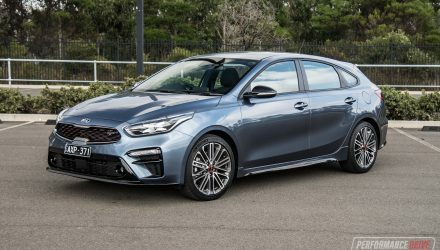 At the front you’ve got the latest inverted grille and angular tri-sectioned headlights, with a blacked-out D-pillar at the rear giving off the impression of a sedan wearing a cap backwards. 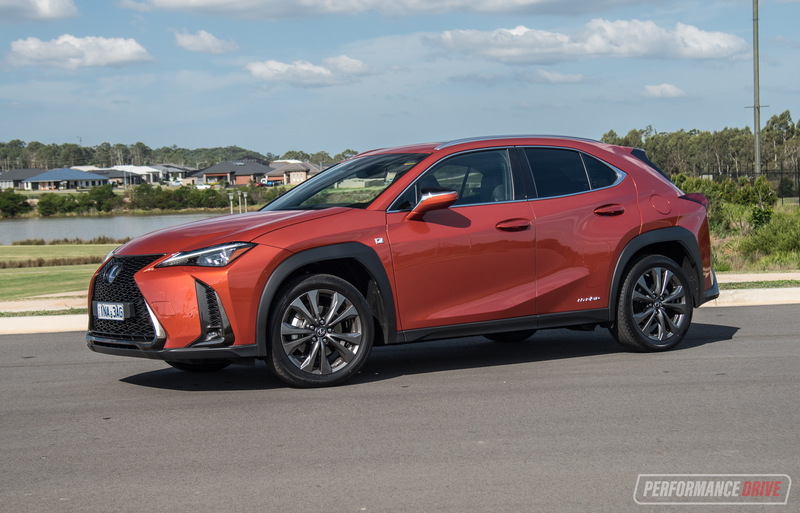 In our opinion, it is one of the most bland SUV designs currently on the market, but in that sense it almost stands out from the rest which are turning to very progressive and sometimes over-the-top designs. Open the door and the word ‘dull’ immediately springs to mind. It looks like Chevrolet hasn’t spent much time on brainstorming up anything creative or flourishing. The way the dash droops down with very few contours and covered in mono-tone plastic, paired with a traditional GM three-spoke steering wheel, it actually reminds us of the Holden Cruze from 2009. 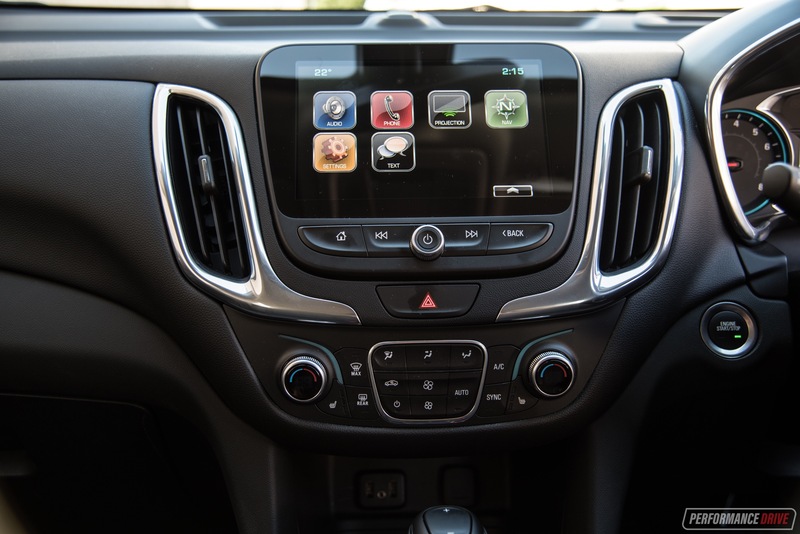 Up on top of the dash is a modern 8.0-inch high-res touch-screen MyLink interface with Apple CarPlay and Android Auto connectivity. It’s quite a nice touch-screen, with sharp graphics and nice colour tones, with the all-important home button mounted separately to save you if you go in too deep. 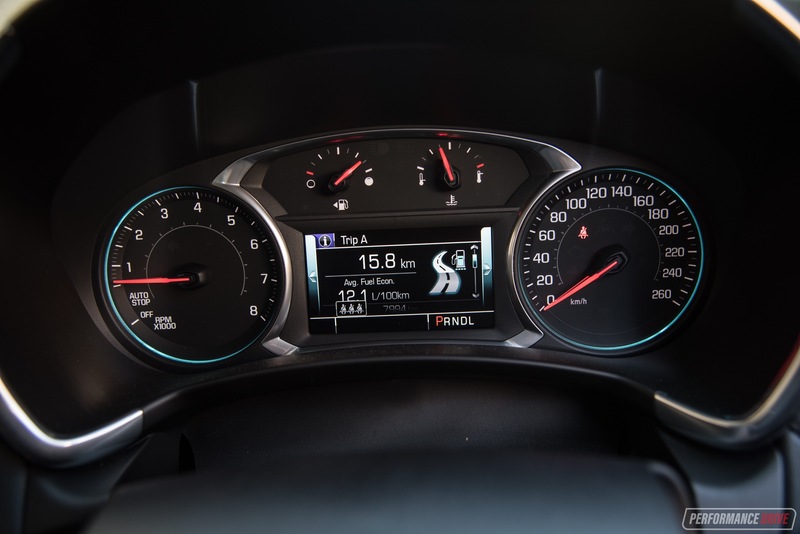 There’s also a conventional rotary volume knob for fast adjustments, and the dual-zone climate controls are mounted below as a separate widget so you can make changes without having to navigate around within the touch-screen. It all works well and is very easy to manage. 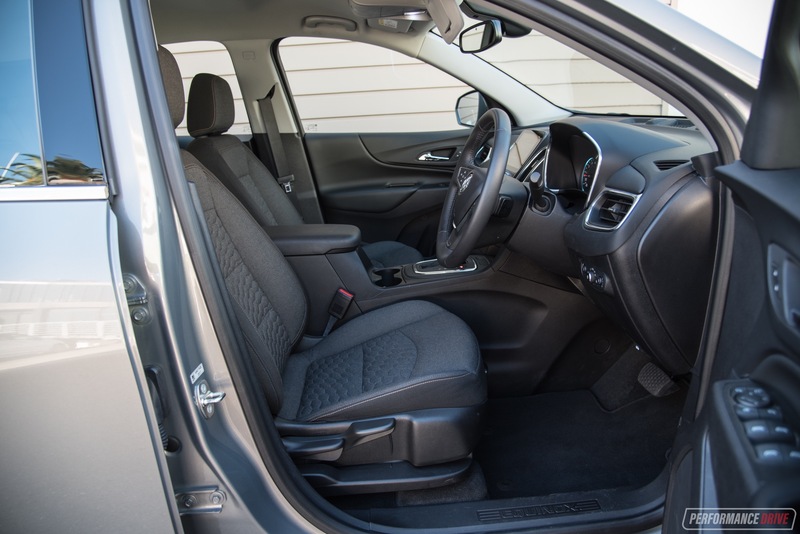 Those attracted to simplicity will love the way the Equinox’s interior is presented. What’s also attractive is the cabin space. It’s huge in here, with one of the biggest centre console boxes we’ve ever seen – check out how tall it is. Now this is a proper arm rest. Inside it is a deep recess that’s almost too big. If you fill it up, we could imagine it would be like trying to find the keys in women’s handbag. Just in front of the console box are two cup holders, with a tray in front of the basic gear selector module. 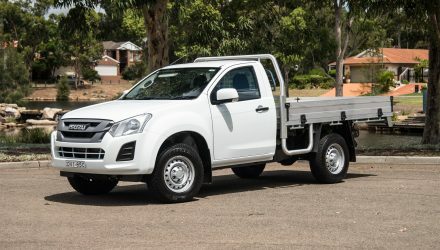 Seating space is very accommodating, with plenty of headroom even for tall individuals, and excellent legroom in the back enhanced by a completely flat floor and no evident driveshaft tunnel. There are some climate vents in the back of the centre console for rear passengers, and there’s a 12V outlet and two USB sockets for charging devices. A chunky flip-down centre arm rest also provides two big cup holders if you’re travelling with four people. 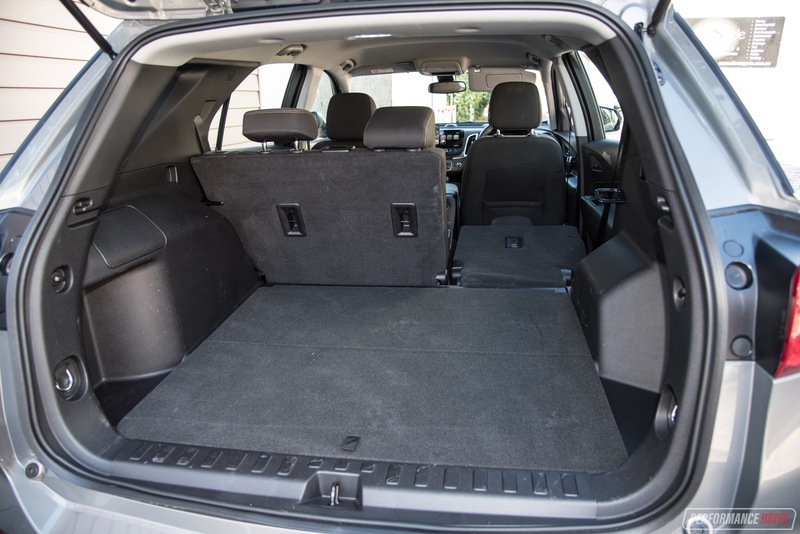 Cargo space is very abundant, with a massive 846L available with all seats up. 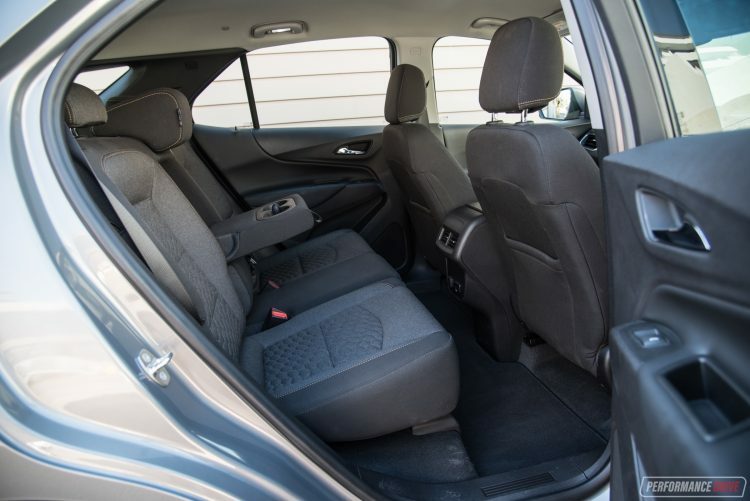 You can fold the rear seats down – completely flat – and it’ll open up 1798L. At this capacity it’s not too far behind the old VF Commodore wagon which offered 895L/2000L. 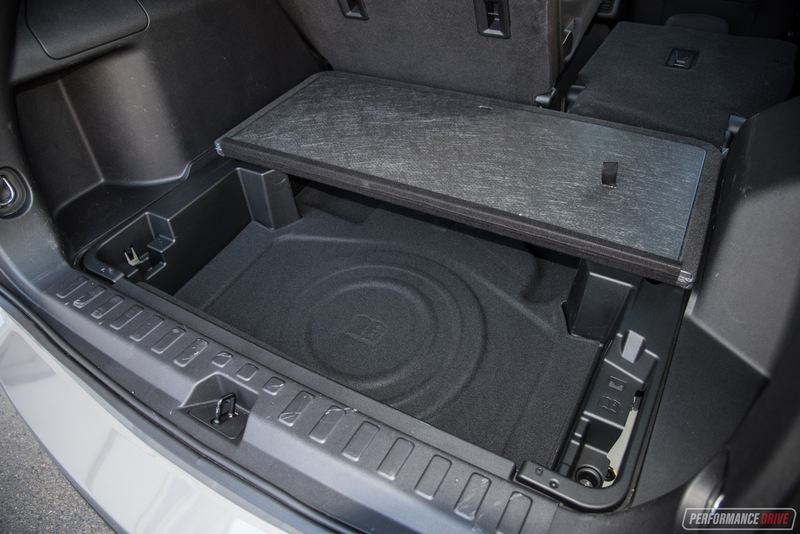 As a bonus there’s a segregated under-floor section in the boot so you can secure smaller objects or valuables. Under that is a space-saver spare wheel. 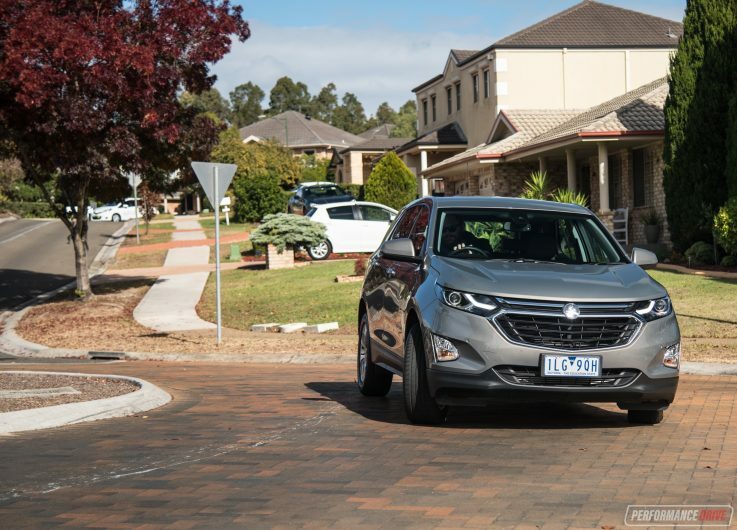 Holden has packed in a heap of advanced safety technologies for the Equinox, with all variants coming standard with at least six airbags, a rear-view camera, and auto headlights, while stepping up just one variant level from the base LS to the LS+ (and above) adds a forward-facing camera system. 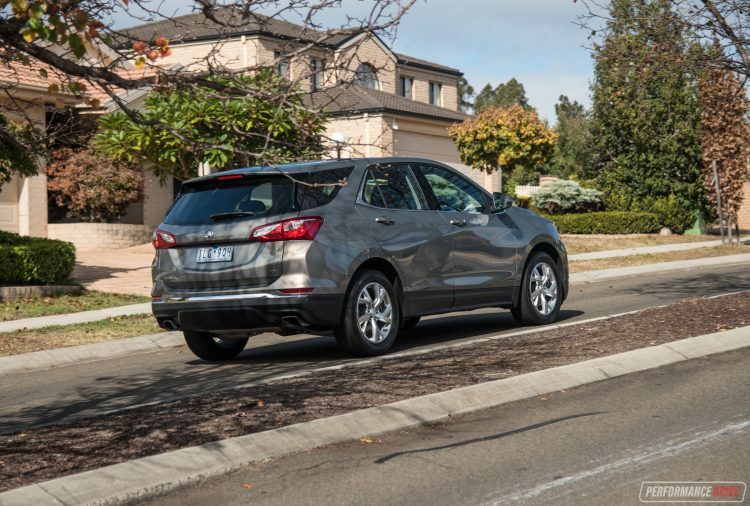 It brings in a comprehensive suite, including autonomous emergency braking, lane-keep assist, blind-spot warning, and forward-collision alert, along with rear cross-traffic alert and adaptive high-beams. 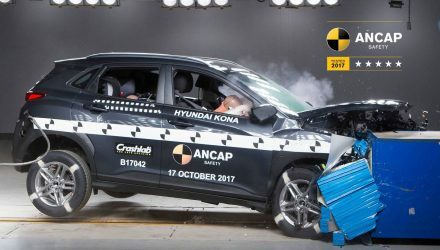 All models are stamped with ANCAP’s five-star safety rating. 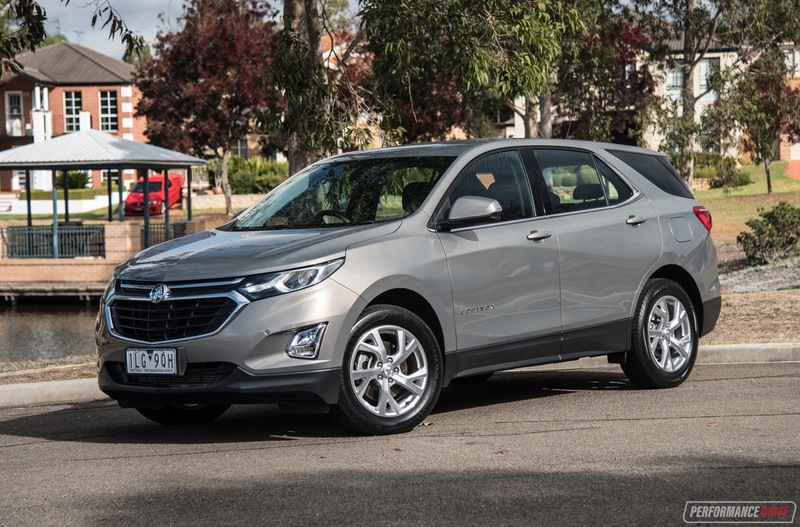 Overall, the Equinox’s cabin is certainly easy to live with and quick to acclimatise to. All of the controls are placed where you’d expect to find them, and there is plenty of adjustment scope to find a comfortable driving position. This 2.0-litre turbocharged four-cylinder engine is a gem. 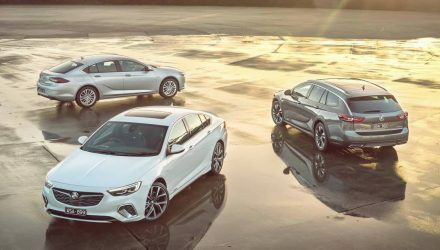 It’s the same engine that’s offered in the new Commodore, paired with a well-synced nine-speed automatic. Power is rated at an impressive 188kW, available at 5500rpm, while 353Nm is found across 2500-4500rpm. This makes it the most powerful vehicle in the non-premium, front-wheel drive medium SUV class, in front of the Ford Escape 2.0T (178kW). It’s also the second most powerful SUV in the class outright behind the 200kW Jeep Cherokee 3.2L 4×4. 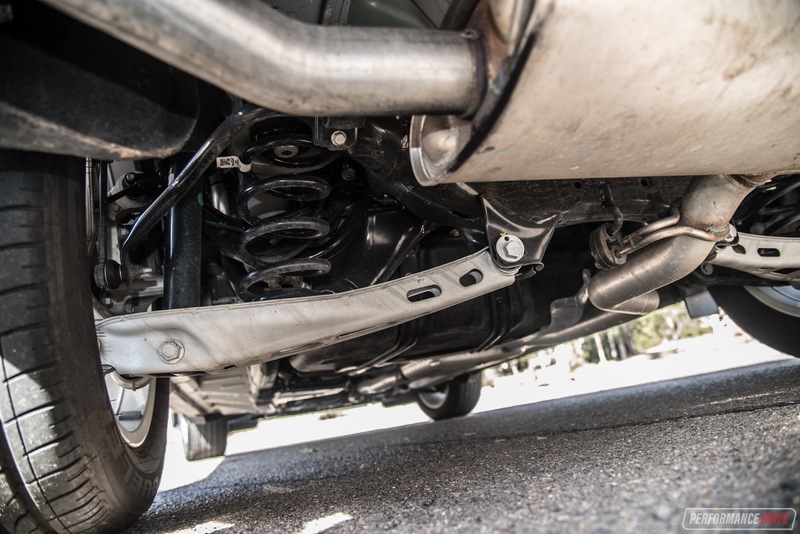 With all of this sent through an unsophisticated front-wheel drive system, mounted in between MacPherson struts, you can probably imagine the stress that’s applied to the front tyres. Measuring 225/60, these tall, Bridgestone Dueler HP Sport tyres don’t really stand a chance. Even with the traction control left on, flooring the throttle will result in hilarious, several-metre-long black lines being painted onto the tarmac. 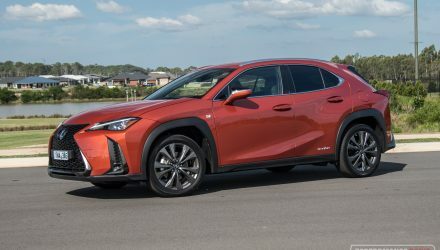 There’s no limited-slip differential to harness this power, as expected for a practical crossover like this, but the amount of power does rather noticeably topple the overall balance of the vehicle. 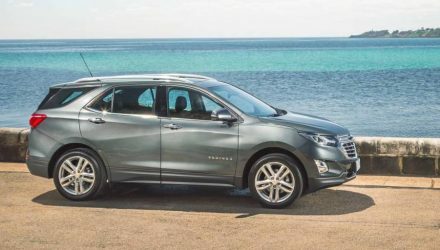 For us driving fans, it is a bag of fun to drive, and perhaps makes the Equinox an attractive package for all of the dads out there who are being persuaded to jump on board the SUV bandwagon by their better halves. The driving dynamics are pretty good. You can thread it down a nice section of mountain road with decent response from the steering and good lateral grip. Although the steering is a little numb, there is eagerness to turn in, resulting in a surprisingly fun and entertaining driving experience. For this vehicle type anyway. However, you do have to be mindful and respect that accelerator pedal, otherwise you’ll be frying tyres all the way home. If you are lured by the amusingly high power and speed, be warned, the brakes can be easily overwhelmed. Pitching the Equinox down our usual mountain road test route, which we subject all vehicles to no matter what class of car, the brakes showed signs of premature fade and pedal drop for us. Obviously the Equinox is not designed for sporty driving, but neither is, for example, a Mazda CX-5. However, the CX-5’s superior overall balance means the acceleration and power doesn’t overshadow the braking performance. Most of the rivals behave in a more balanced manner than this Equinox in our opinion. 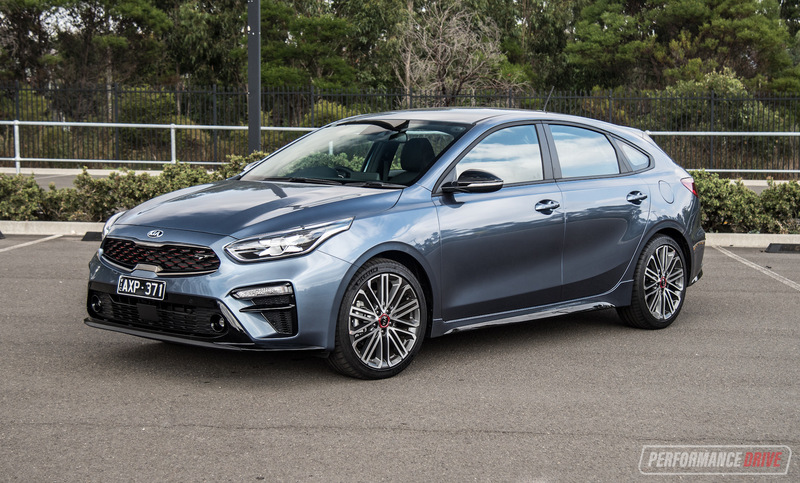 We really like the nine-speed automatic transmission as it provides suitable gear spacing, with long first and second gears making use of the engine’s significant torque in city conditions, followed by quicker third and fourth gears for an energetic tempo once you’re up to speed. Speaking of getting up to speed, we managed to record 0-100km/h in just 6.78 seconds, and the quarter mile in just 14.90 seconds. It’s bloody quick, and in fact not far behind some serious hot hatches that we’ve previously tested: VW Golf GTI DSG in 6.54 seconds, Renault Clio RS 200 Cup in 6.89 seconds. 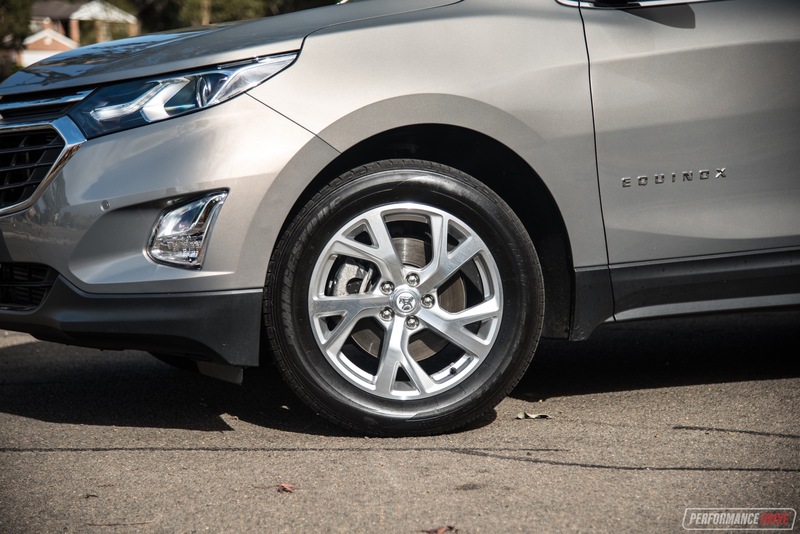 Around town the Equinox feels light and easy to drive, with a well-proportioned exterior making it a breeze to park. You can raise your seat up for a commanding view, with good forward visibility. Looking over your shoulder into the thick C-pillar does mean you need to check twice, but most of the modern rivals share this trait due to contemporary body designs winning in favour of sheer practicality. 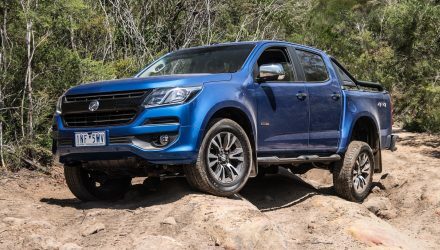 The ride quality is pliable over Australia’s shoddy roads, yet with enough bracing and support to rule out excess body movement around corners. The tall tyres also help to absorb rough surfaces. About the only area that isn’t practical in normal conditions is the fuel consumption. An official average rating of 8.2L/100km seems quite far-fetched in our opinion. During our week-long test with a mixture of lots of highway driving as well as performance testing and a spirited mountain run, the trip computer said we averaged 12L/100km. This is not at all acceptable for a modern mid-size practical-focused SUV, especially against others that we’ve tested in almost identical conditions. Keep in mind none of the rivals offer this level of power or straight-line performance. You won’t experience any feelings of uplifting emotional spirit driving the Equinox. It does set benchmarks for boot and cabin space, and some areas of the interior are also more practical than others in this class. However, if it wasn’t for the fierce engine, we’d categorise it as the most bland SUV on the market right now. Although it does blend in with its surroundings like an orange brick in a 1970s Sydney suburb apartment block, the Equinox 2.0T offers an almost inappropriate (for most buyers) performance advantage over its competitors. 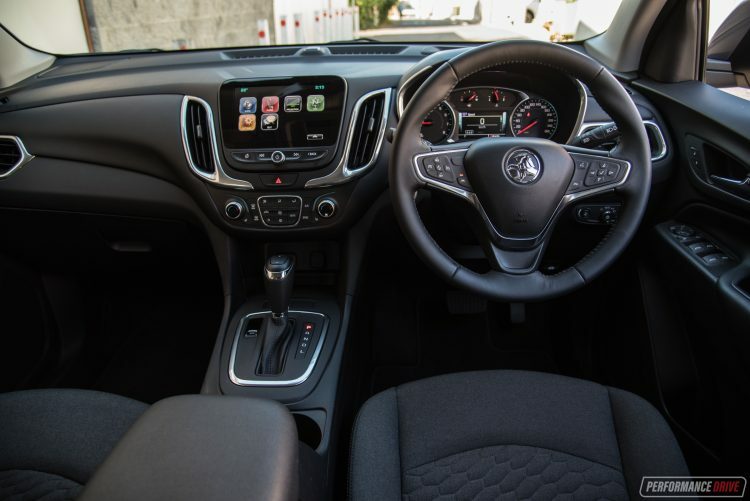 Pair that with a roomy and easy-to-understand interior and, to us, what you’re left with is the perfect hire car. As a potential option for private buyers, we think you should check out some of the rivals before signing here. Most competitors are dynamically superior and atheistically a lot more pleasing inside and out. 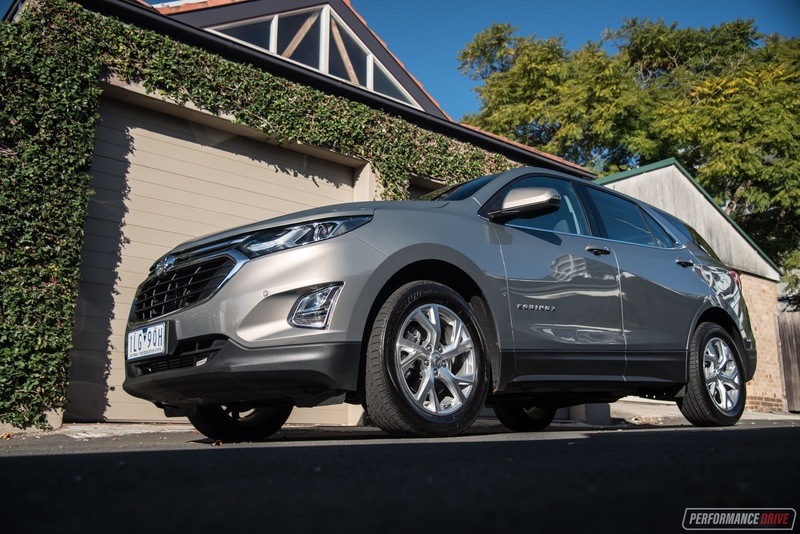 The more popular rivals, such as the petrol Honda CR-V, petrol Mazda CX-5, and petrol Hyundai Tucson, are also significantly more fuel efficient compared with this 2.0T version. 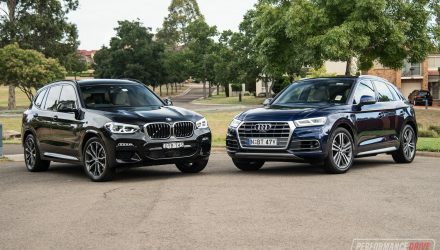 – 2.0 turbo model is very fast – sleeper potential?